TAY Blip: Monster Hunter 4 Ultimate Weapon Contest! I figured I'd put this out here since we have some wonderful artists and creative minds on TAY. 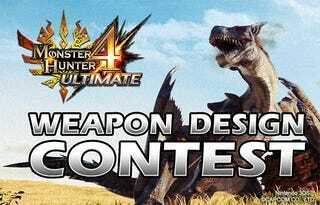 Capcom is holding a design contest for a weapon that could be featured in MH4u! Your task: design and name a weapon in one of MH's weapon classes. Keep in mind that there are two new weapon classes in MH4: the Insect Glaive and Charge Blade. Label your illustration and feel free to provide a short description. You can read about all the details, terms, and conditions here.